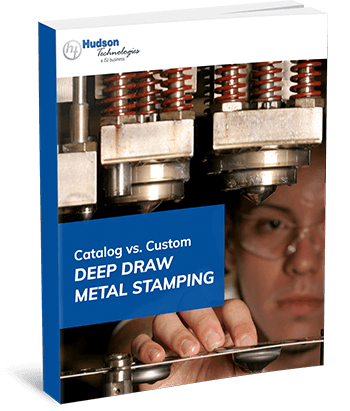 Since 1940, Hudson Technologies has been providing industry-leading custom metal stamping and deep drawn stamping services services for a range of different industries. Our products are frequently found in medical, aviation, aerospace, defense, semiconductor, and commercial applications, among many others. Offering precision metal stamping services from start to finish, from prototype to production, we employ state-of-the-art equipment — including progressive, transfer, and single-station dies — and complete all engineering, design, tooling, and gauge and fixture building in-house. This allows us to provide higher-volume production and higher-tolerance parts than those offered by standard metal stamping processes. This is essential for ensuring that the often-overlooked, critical small parts are of the highest quality possible for the desired end product. The medical industry makes frequent use of custom metal stamping. Many of the components that Hudson manufactures become parts of life-critical components for the patients that receive them. These components must be crafted with the utmost precision and care to ensure optimal safety and performance. The team at Hudson can create a wide range of deep and shallow drawn metal parts that meet or exceed customers’ exact specifications, working with materials such as titanium alloys (grades 1, 2, 5, 7, 9, 11, 23, 15-3-3-3) and stainless steel alloys, as well as specialty medical-grade options. We offer post-stamping modification services, such as CNC machining, laser cutting, and drilling, as well as in-house heat treating/annealing, in-house aqueous cleaning, and post-stamping surface conditioning, finishing, and coating services. Aviation and aerospace applications also require unmatched precision and reliability, as aircraft manufacturers must adhere to very strict regulatory standards to ensure optimal safety, function, and comfort. Commonly used materials include aluminum (1100, 3003, 5052, T4, and T6), brass, cold-rolled steel, high-carbon steel, nickel silver, cupro nickel, HyMu 80, Inconel®, titanium, and stainless steel. We can provide plating, countersinking, anodizing, deburring, machining, tapping, painting, passivation, and powder coating and silk screen services for clients in the aerospace and aviation sector. Hudson also manufactures various components used in semiconductor wafer fabrication processes. Titanium, stainless steel alloys, Hastelloy®, and Inconel® can all be utilized in these applications. Other services include specialized tooling, finite element analysis (FEA) design, and customized packaging. When custom stamping for commercial applications, our press tonnage can be as high as 500 tons, with customizable material thicknesses and a wide range of bed press sizes available. Process capabilities include low- to medium-volume specialized stampings, high-strength material stampings, large stampings, and deep-drawn stampings, as well as subassembly, spot welding, drilling, and heat treating. Commonly worked materials include aluminum, brass, copper, cold-rolled steel, HyMu 80, stainless steel, nickel silver, cupro nickel, and titanium. Hudson Technologies has been an industry-leading metal parts and diaphragm designer and manufacturer since our founding in 1940, and we’re proud to be at the forefront of today’s custom metal stamping technologies. To learn more about our services and discuss how they can help with your unique application, contact the team today. Or, for more information on our precision laser technology, check out our comprehensive eBook.